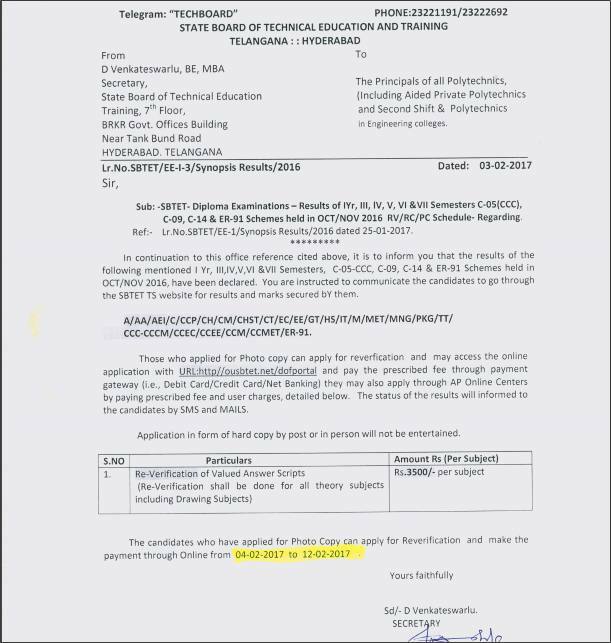 SBTET-Diploma Examinations - Results of 1Yr, III, IV, V, VI & VII Semesters C-05 (CCC), C-09, C-14 & ER-91 Schemes held in OCT/NOV 2016 RV/RC/PC Schedule-Regarding. The candidates who have applied for photo copy can apply for Reverification and make the payment through Online from 04-02-2017 to 12-02-2017 . If you have any doubts regarding to this post comment below.For more latest updates follow us on social media and like our face book page.